The US Energy Information Administration (EIA) recently (April 2009) made a forward projection of estimated energy generation costs for 2016 in its Annual Energy Outlook 2009. The results are given in the table I’ve reproduced below (click on it for a larger version) — the original comes from the Next Big Future blog, here. Nuclear Green also has a post on it, with an alternative figure, here, NEI Notes here, and there is an excellent summary provided by the Institute for Energy Research, here and here. The IER are the guys who extracted this data from the AEO 2009 report and summarised it in a useful format. Make sure you read these links: they’re packed with useful analysis. Prices are expressed in 2007 US dollar terms per megawatt hour [MWh]. To convert these figures to kilowatt hours [kWh] — more relevant to you, perhaps, because you probably use between 120 and 250 kWh per day — simply divide these figures by 10, and read as cents instead of dollars. So, for conventional coal, the table tells you the cost is projected to be 9.4 c/kWh, whilst for wind it is 14.2 c/kWh. O&E stands for “operations and maintenance”. The levelised energy cost is an economic assessment of the cost the energy-generating system including all the costs over its lifetime: initial investment, operations and maintenance, cost of fuel, cost of capital. These costs deliberately exclude state and federal subsidies, to give you the real figures. The AEO 2009 report also includes an energy demand projection through to 2030. One might choose to dispute any of the entries given above, for a variety of sound reasons. For instance, the cost of Advanced Nuclear is based on an overnight capital cost of about $8 billion per GW installed capacity for the US, when the recent Asian experience (Japan, Korea, China) is considerably lower (between 1/2 and 1/4 this price). Likewise, the price of gas might rise considerably higher than the EIA anticipates, especially regionally, as geographically important supplies dry up in places like the US and LNG prices rise concomitantly due to export/import bottlenecks. I’ll be interested to see the debate that ensues in the comments below, especially from those who advocate cheap renewable energy. Topics for discussion might include the following: Do you believe the EIA forecast is reasonable overall? What about for your ‘favourite’ energy source? If not, why not? What’s been left out? Have hidden costs (e.g., investor confidence, energy storage and backup, etc.) been adequately represented? Has peak oil or the ongoing effects of the global financial crisis been properly factored in? Couldn’t make out kwh figures in the zoomed out table so I’ll delve into the links. Meanwhile a formula I use for a lower bound on kwh prices for energy sources with negligible fuel and labour costs is rC/(8.76c). The capital cost per watt is C, the financing cost (interest and depreciation) is r and c is capacity factor. Thus new nuclear could be at least 0.1(8)/8.76(.9) = 10.1c per kwh. Using the same financing rate for wind and other conservative parameters we get .1(4.5)/8.76 (.35) = 14.7c per kwh. Using shallow cycle lifetime rather than capacity factor I calculated that each kwh drawn from lead acid batteries costs at least 11c. As far as I am aware no other non-hydro energy storage method is orders of magnitude better than that age old technology. Electricity transmitted via the high rent Basslink underwater HVDC cable works out about 5c per kwh on top of generator prices. I believe it is possible to look ‘middle class’ (eg showered) on as little as 6-8 kwh a day per person of electricity omitting personal transport but using non-electric cooking and water heating. It requires some discipline and methodical preparation. Which is why I doubt it can be done via willing conservation on a large scale. To combine the capital cost with the ongoing costs to get a total levelised cost requires assumptions about the discount rate. The thing is, you will always have to make assumptions concerning specific input parameters for studies trying to reflect future economics. Nobody knows wether or not this will come true, but as long as the input parameters are described and listed transparently and their value is explained plausibly, those studies should be seen as scenario, not as fact. I’m sure that just like you pointed to the underlying assumptions for nuclear energy, supporters of other power generation principles might as well shout out that the report is not as they want it to be. Point missed. The concentration on natural gas — five variants! — coincides with its being the fuel whose royalties and taxes are most significant in the EIA’s budget. There is no entry for conventional nuclear, and this coincides with its being the fuel that has been most effective in depriving government agencies of fossil fuel revenue. Assuming CCS stands for carbon capture and storage, I suspect there’s some heroic boosterism going on there, since it’s never been successfully demonstrated at commercial scales. Except here. And in the peridotite fields of Oman, among other places. And this “Advanced Nuclear” is simply generation III plants…not the expected cheaper Gen IV ones. At any rate, this goes to show…why the huge network of giant windmills and 5 hour-a-day peak solar farms? This is why the world is taking to nuclear again. Cowan, your link didn’t work. I’m sorry G.R.L.Cowan, that link did not demonstrate relevant commercially ready CCS for coal fired stations at all. There are a number of arguments that are put forward in the EPA’s report that will be cited in future debates. 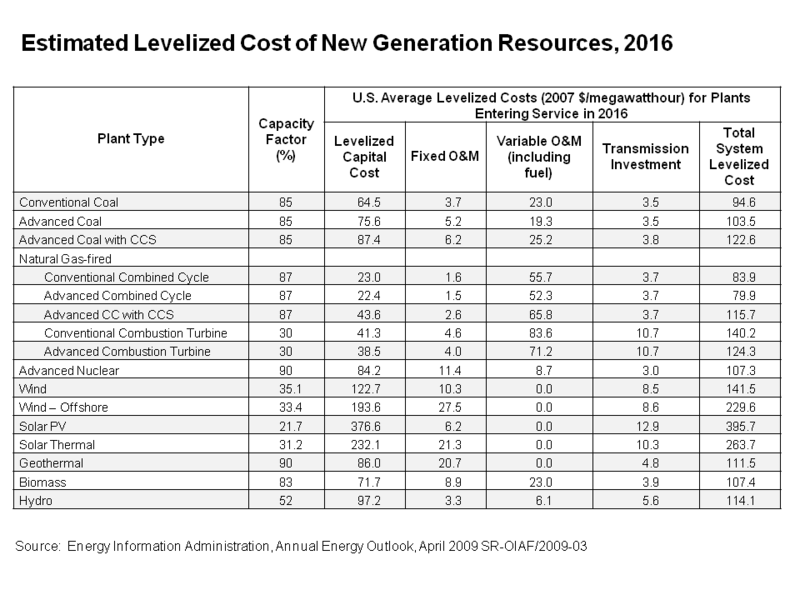 The EIA levelized capital cost of wind farms of $122/MWh doesn’t seem to match assumptions of 2007 overnight costs of wind being $1915/kW capacity and financing costs of 6%. Infigen(ASX;IFN)gives its cost of financing in US as 6%(over a 15 year payback period) about $900 interest for a total payback of $2815 principal plus interest). Since each kW capacity generates 2.9MWh/year or 58MWh/20years we have a capital cost of $2815/58= $50/MWh. This is close to the CSIRO estimate of $AUD 55/MWh total costs. Since IFN’s average sale price is $US 75/MWh and they are making profits on this price I am not sure what assumptions EIA are making about 2015 costs or interest rates. A note that wind farm costs have been declining over last 20 years.Also wind power price is very sensitive to life of project and to capacity factor. Both of these have been increasing over last 20 years. Perhaps they are using historical values of turbines built 15-20 years ago? In comparison, EIA are estimating very minor cost increases for NG. However, the levelized capital cost(2006$$ for 2015) for wind is given as $64/MWh and for nuclear $50/MWh. This seems like 2009 data has a very big increase(100%) for wind energy in one year! Identical table but some figures very different? Neil, the link below might help answer your query — it’s about as comprehensive (and readable) compilation on different levelized cost estimates I’ve seen. Both of your stated figures are in there. It seems there is a lot of ‘operator variation’ — depending on who is making the estimates and what the underpinning assumptions are (e.g. interest rates, current material costs, plant lifetimes, etc). This is a neat new blog by the way — check it out. An interesting link, seems to be using the same figures from EIA table. Its hard to reconcile these figures with actual wind, or nuclear cost estimates(Florida Power,Ontario), or to understand why US utilities are not building out nuclear. Even stranger is why any solar is being built when wind is projected to be half the cost( may be a better match to peak demand). I can’t understand why EIA has doubled the levelized capital cost of wind in one year(2008:$64/MW versus 2009 figures $122/MW), and wonder what EIA 2010 figures will be( prices of wind turbines have declined by 20% since 2008). No one should be building wind in the US with the EIA estimates, but Vestas reports US orders for turbines have increased this year.